i am looking through the over one thousand photos i took while in italy, and i keep coming back to a few thoughts. my favorite photos are the ones with me in it. please don’t take that a self-absorbed comment – but one that acknowledges you can only have so many pictures of the colosseum or some other ruins before they all run together. i am so happy that i flipped my camera around to capture me in the moment with the memory in the background. i will admit that i felt a bit silly at times taking “selfies”. as popular as this type of photo is, it has a negative stigma with many people. i even found that most people would step up and ask if i would prefer them take the photo of me. while i did this from time to time, there were not always groups of people around to ask, or they were busy trying to capture their own perfect photo. i am glad i preserved through and kept taking them. i will probably never see any of my co-travelers again anyway. the other thing that pops into my head are all of the missed photos. many of places we could not photograph in were the coolest places i visited. for example, you cannot take pictures in the sistine chapel. i watched security escorting a guy away that tried to sneak in quick shot on his phone. it was serious business in there. while most churches and basilicas just ask that you use no flash, something just didn’t feel right for me about taking ton of pictures inside an active place of worship. (that is just my personal feeling – but i was one of the few that was not snapping away). the few i had didn’t turn out well as i definitely did not pose in these situations. one of the most interesting places (and one i knew the least about prior) was the catacombs. here, absolutely no photography was allowed. the catacombs are just outside of rome and were the underground burial site for thousands of romans, including many early christians. i walked with a small group, seeing the actual ‘holes’ and family rooms where people were buried nearly two thousand years ago. some of the original murals and inscriptions are still in place. this place was amazing. since i was not busy taking pictures, i feel i probably better inspected, listened, and absorbed what i was experiencing. 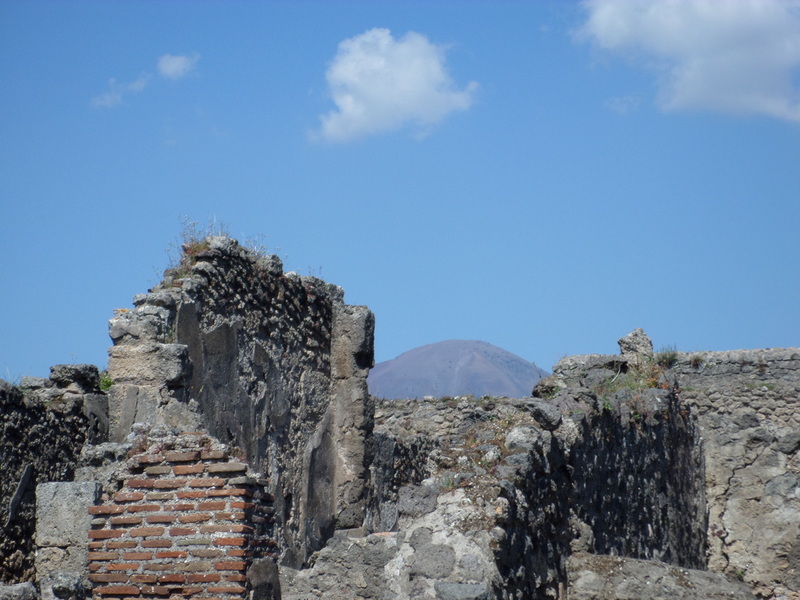 i may not have any photos to print or share, but my memories are better than some that i have of pompeii, where i was always on the look-out for the next picture. 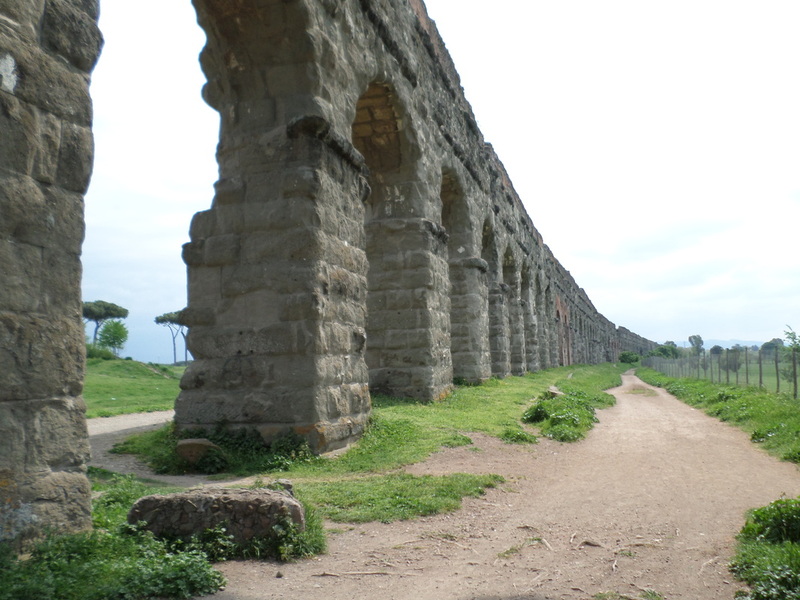 we wrapped up the trip with a walk down the appian way and around the aqueducts. 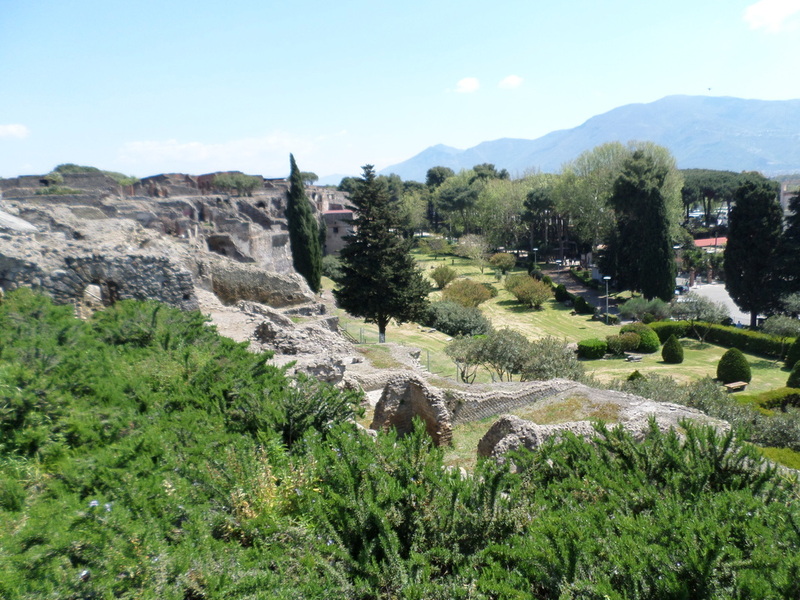 i really appreciated this tour not only for the variety and mix, but also because it took me just outside of rome – which can be over-stimulating at times as it is so busy and populated (granted visiting during holy week pumped up the tourists in town). this was a favorite guided tour (disclaimer – i think i say this about every tour). i dread being asked what i do for a living. my answer cannot be a one word or even a one sentence explanation like teacher, doctor, lawyer, or student. i don’t like trying to explain it because if you do not know about cloud and software implementation and so on – you will look at me with a glazed over expression and nod politely. sometimes i like to make up answers. ninja is probably my favorite response; super model is my second favorite. both obvious lies, but i prefer a laugh instead of the confused haze. my second least favorite question is “what is your favorite [insert anything here]." i don’t have a favorite band, song, movie, color, food, season, animal or vacation place. i mean why pick just one answer when there are so many great options. don’t get me wrong, I definitely have preferences and strong likes - just not favorites. so what happens when i return? obviously everyone asks me what my favorite sight was or what the best thing about the trip was. here is where you see me freeze up and go deer in the headlights. i probably should have thought about this on the 11 hour plan ride back. it probably would have taken me that long and then I probably would change it each time i thought about it. i simply cannot peg a favorite on my italy trip, although gelato and pasta are pretty high up on the list. i can say that one of my favorite days was pompeii. since pompeii is near naples (about 2-3 hours south of rome), i signed up to tackle this with a tour group since i was not interested in renting a car or trying to coordinate with train schedules. 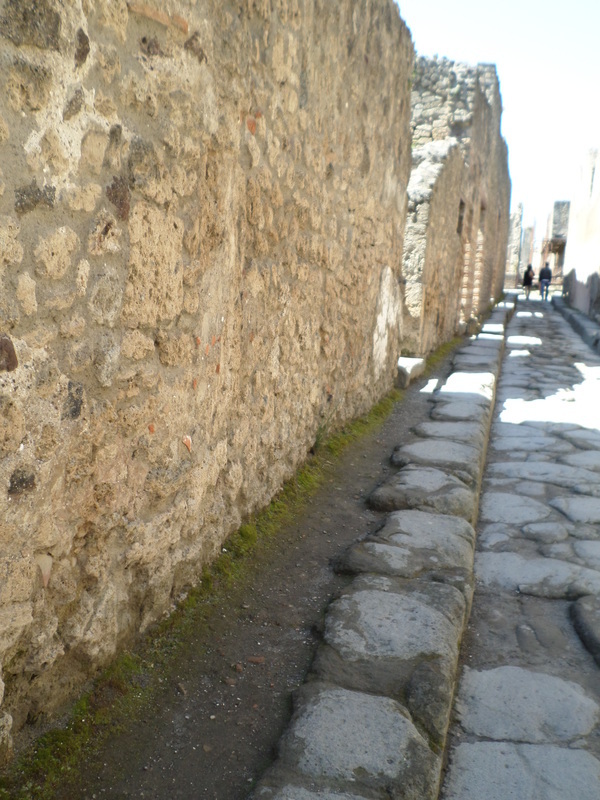 when was looking into tour options most included city tours of naples and pompeii. 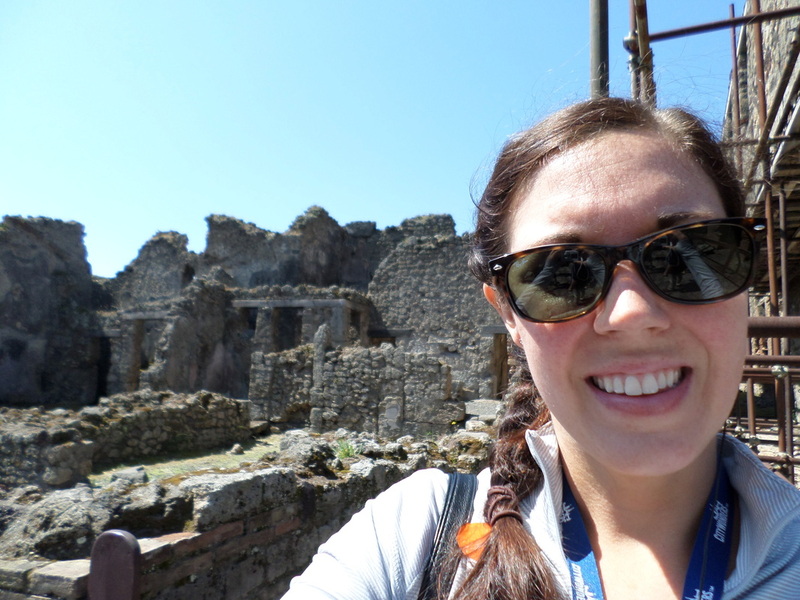 i almost landed on those trips until i found one that toured pompeii, included a pizza lunch in naples, and then hiking mount vesuvius. and that was all she wrote – i had to hike to the top of this volcano. now, this is interesting if you know me – i dislike heights (more like an opportunity for a massive/deadly fall), i am not extremely active or fit, and i don’t particularly enjoy hiking mountains as i found out in peru. but, i had to do this. there is something about a unique experience like hiking one of the most violent volcanoes that overrules all of my reasons not to hike. end of discussion. i signed up as there was no other trip as cool as this one. let’s jump past the bus trip right back to 79AD in pompeii. 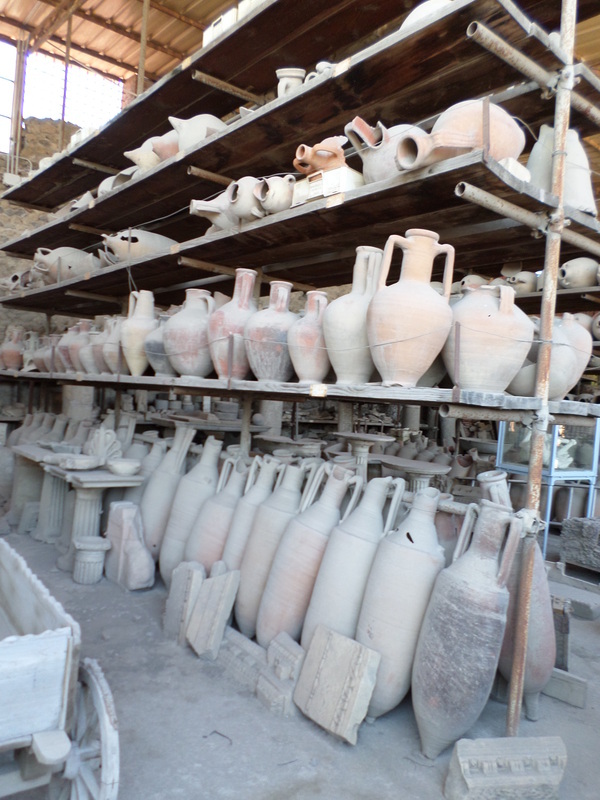 one of the same sensations happens to you in pompeii as in Rome – the wonder of age and history. to walk on the same roads, enter through the same doorways, view the same murals as people did here two millennium ago is different than anything i have experienced state-side. we are a country that just doesn’t have that history – maybe that is why i treasured this experience so much. 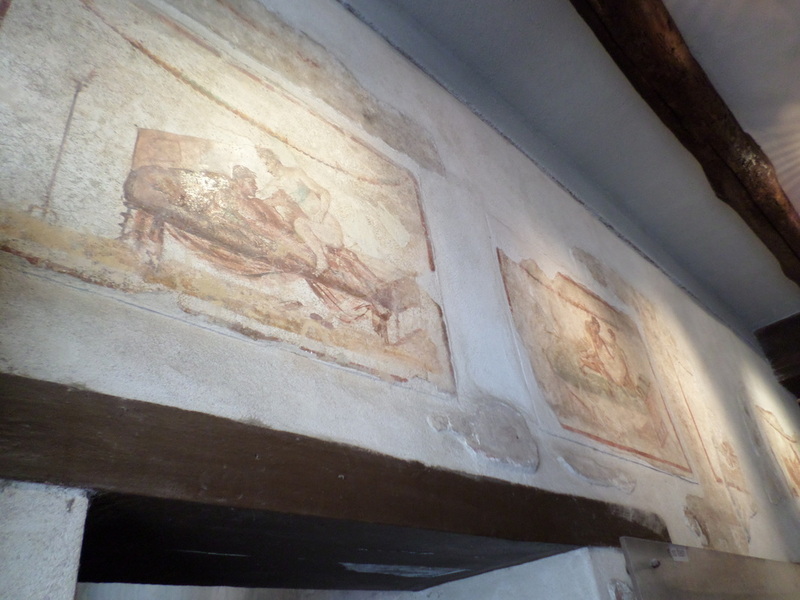 pompeii is so well preserved it makes imagining life back then easy and realistic. what did i notice? they were really short – the average height of a woman would have been barely five feet tall. i would have been a whole foot taller than almost every woman there! they had a ‘red light’ district. one of the houses that i got to walk through still had paintings of services above the door! the beds were made of stone and really tiny (back to the height thing). they had some crude plumbing – using lead pipes. so if vesuvius didn’t take them out, i bet their water probably would have! from most vantage points, you can see vesuvius in the background. it is beautiful now and probably was then too – right up until it blew its top. i didn’t know it was still active. i didn’t know scientists predict that it erupts approximately every 2,000 years. i got pretty excited with this news. last explosion = 79 AD. current date = 2014 AD. a few decades either way – and we may be alive when it erupts again. please do not read that as i am excited about the after-effects or potential disaster it will be – but there is just something magnificent about nature that powerful. 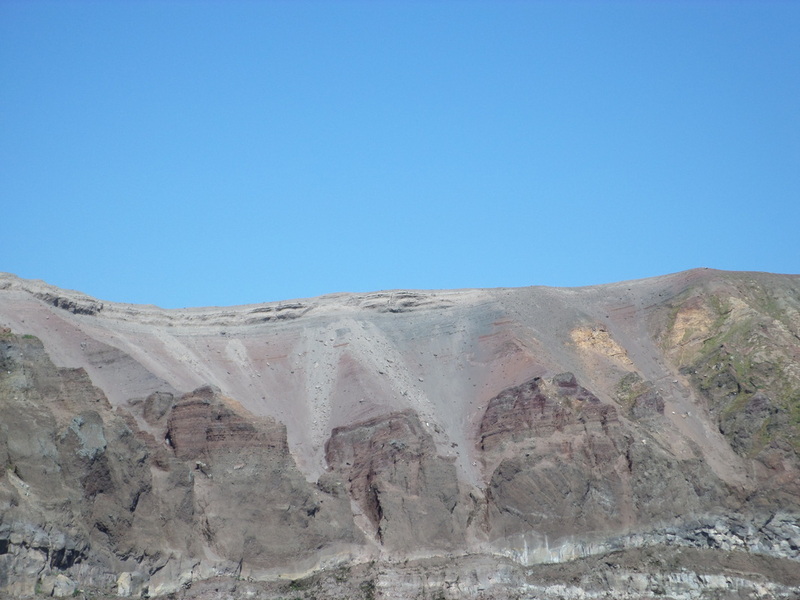 i have never been on an active volcano – so i had to hike to the top. i will say that we got bused most of the way. you have to make the last and steepest climb on foot. once i finally got to the top (i am skipping the pep talk i had to give myself to hike up), i looked around. honestly, from on top – it is just the top of a mountain with a crater instead of a peak. then you see the steam coming from within the crater. then you turn around and look at the bay of naples. it is something that i cannot describe in words. once i started the journey down, all i could think about was, “man, i am going to have to hike this mountain again” as all i wanted to do was to bring my closest family and friends to experience what i had experienced that day – a city instantly buried and preserved and a volcano that threatens to do it again! as I get older, many details of my younger years fade. the bold statements, big events, and true friends are the things that remain clear and ever with me. one bold statement that will ever remain with me and that potentially sent me down and a different road was from my freshman and senior english teacher, ms. hannah. she told me that serious students (in my memory this may have been scholars) studied latin. this was in reference to me trying to decide which foreign language to study for the next two years. i considered myself a serious scholar at the time, so i signed up for latin with mrs. manson - albeit terrified as it was the "hardest" of the languages my high school offered. so after three years (yes, i opted for the additional third year), I was semi-versed in latin. i still have my copy of the Aeneid - with translations that I did in the margin. now, over 12 years later - sadly much of those language skills in translation have faded. however, my love of latin and rome still remains. in college, i majored in economics; i even received a masters. i took spanish and studied aboard in mexico. now, my job is completely unrelated to either economics or latin or spanish (which i cannot understand even after studying abroad in mexico). however, my job did bring me to rome. 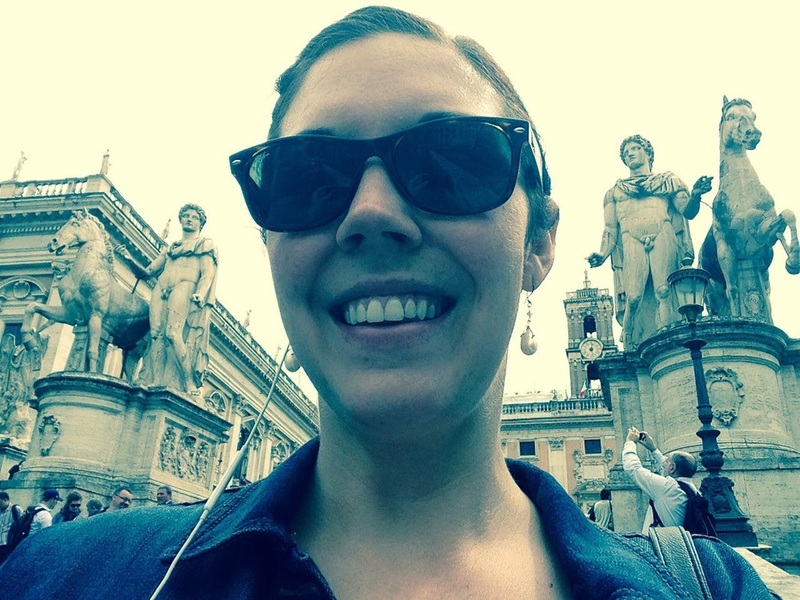 rome is a place i have dreamed of since i first started learning latin in high school. and i am here. rome. i took some vacation time because there was no way i was going to rome and not seeing everything possible. i planned nothing but my hotel as i wanted to get a feel for the city before i decided anything. i attempted to see the vatican during a free afternoon while at my conference. i have forgotten to mention that my vacation is falling over holy week, and i feared crowds and tried to see this spot as early as possible. the vatican for me was a disaster. lines. crowds. closed-off areas. i joined a guided group to skip the line and hopefully navigate the chaos but this was an utter failure. the group grew and grew and waited and waited only to get in and then be directed by a guide to go here and . . wait. and then, go here and wait. finally, i split from the group and went on my own. finally, i saw some of the vatican. there are no pictures of the good stuff as you are not allowed to photograph the artwork. so i left feeling frazzled and fried. i didn't like the vatican. the paintings on the ceiling of the sistine chapel were smaller than the hype. sorry, but that was my experience. plus, the guide got irritated at me as i could read the building names and dates in latin. this interrupted his waiting/guessing game with the group. he would ignore me as i called the correct answers to his questions. between this and trying to find dinner before eight in the evening (impossible unless you eat at a tourist trap), i was fearful as i headed into my vacation. i was not loving rome, this idyllic city in my mind. then, things changed. 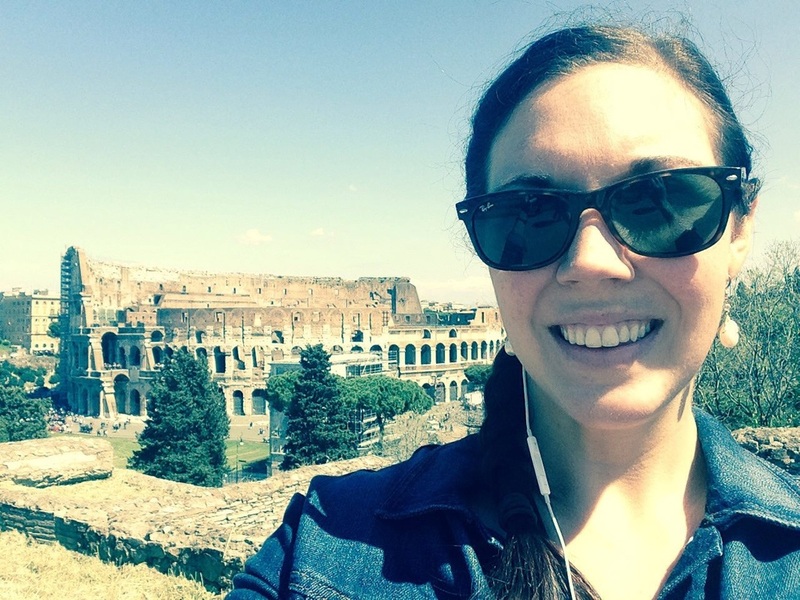 i was alone and wondering the streets when i stumbled onto the colosseum and the ruins that surround it. there are several sites that you can view in this area without lines and tickets and guides. they are breath-taking. it was here that it all hit me; i was finally in rome. i was walking and looking at history that slipped back to the BC era in some cases. while i always dreamed of visiting, i guess a part of me never thought I would actually made it to rome. i almost got emotional as i stopped and just took everything in, history surrounding me. i hope you will share my experiences as i show you rome (and surrounding areas) from over my shoulder - my attempt to classy up selfies. i’m traveling solo on this journey. you see, when you don't have a travel partner, your photo options are severely limited, but these are the experiences and sites that i had to document and write about for you. as I write this my mind is slipping to what pasta I want tonight. it has been three days and over 1100 hundred photos with lots of gelato in-between. with four days left, i have much ground to cover, sights to drink in, and pasta to eat! i am hiking mount vesuvius tomorrow. i'm so excited to introduce you to suzanne, one of most perfect human beings god ever created. that's just my humble opinion, but you'll have a chance to get to know her and judge for yourself. i like to think that i had something to do with her brilliance, but i'm sure she had it within long before she walked into my classroom - the infamous room 3. here's a look at europe over her shoulder. before march 30th, i had never been across the atlantic ocean. amazingly, work took me to prague and rome, and vacation allowed me to stay. i spent a total of 21 days in europe. yes, i was alone. no, it was not scary. no, i do not speak any language besides english. no, it wasn’t an issue. yes, i would have loved for a family or friend to have joined me… however, i treasure my experience traveling solo and would do it again in a second. and finally, no – i wasn’t ready to come home. as i was preparing for my vacation, i remember talking with my mom about vacation pictures when i was younger. she said you should be in the pictures to be a part of the memory you experience there – otherwise you may as well just buy postcards. this philosophy motivated many of my pictures and as a result, i would like to invite you to experience italy from over my shoulder. consider this a more interesting take on ‘selfies’ as i just can’t call it a selfie when i have the colosseum over my shoulder! the hardest part about traveling alone is not having someone to split that bottle of wine with over dinner as you recap the day… so in conjunction with my over my shoulder pictures, i have recapped my adventures here – so I could share with everyone. sometimes it is best to start at the end. at the end, i found myself in a little hole in the wall down a random street i got lost on earlier in the week. it looked cozy. it did not look touristy. it looked like a great place for my final meal. i am in italy. i am on day 20 in europe. i am alone. i have had pasta at least once if not twice every day. i have had wine and cheeses and olive oil and gelato (lots of gelato)– everything that is not on my normal diet back at home. i am having prosecco and cheese to start my meal. an older gentleman walks in and sits down at the piano in the corner and begins to play. it is beautiful. a little boy (i think around 8 years old) walks up to the old man and asks if he can play everyone a song. the older man relinquishes his seat and the younger boy gets comfortable as he prepares to play something from memory. i get ready to endure a child’s song – honestly a bit upset to have the beautiful melodies end just as my food arrives. immediately, i realize i underestimated the boy. he blows away the restaurant – everyone stops talking, eating, and drinking – everything pauses and shifts to watch and listen to this boy play. it is breathtakingly beautiful. he is more skilled and natural than the older gentleman. we clap at the end of the first song, and the older man encourages the little boy to continue. he plays several more songs – including a top 40 song. i couldn’t have imagined a better summary and end to my trip – a perfect blend getting lost turning into a great discovery, fabulous food and wine, expectations being shattered, finding beauty in the unanticipated, discovering classics mingled in with modern, and experiencing it by myself within a crowd. that was italy for me. join me in italy and look over my shoulder; now, let's start at the beginning. . .
over my shoulder is by a covington, georgia native who graduated from presbyterian college and ga state with a bs and ms in business economics. she's a true southern lady naming biscuits as her favorite food. she has traveled to machu picchu where she decided she wanted to see all 7 wonders. her favorite US places are sonoma, california, and alaska. next on her agenda is to make it to new zealand, australia and south america . . . or wherever she finds a wonder.